 A sometimes moving but often frustratingly evasive collection of meditations on AIDS by a physician who has lost his twin brother to the disease. 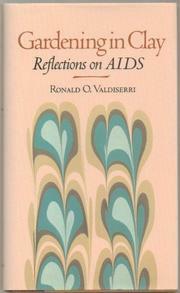 Valdiserri brings a fascinating combination of experiences to a discussion of AIDS; in addition to his devastating personal encounter with the epidemic, he is deputy director of the Division of STD/HIV Prevention at the federal Centers for Disease Control and Prevention. Unfortunately, he too often finds refuge in truism. The book's framing metaphor, that of gardening, underscores the well-worn notion that we do not grow without pain and loss, that some good always comes out of disappointment and defeat. Fortunately, this Panglossian cheer is sometimes tempered by more convincingly evoked rage; he calls his anger over his brother's death ``a grotesque lens whose wavy yellow glass distorts everything I see and do...'' and admits that only ``on the good days'' does he think that he will ``become a better person because of this ordeal.'' Some of Valdiserri's metaphors are bold and powerful. A little-known painting of the Virgin Mary dying from the Black Death ``already partly consumed by toads and snakes...diseased and decomposing'' reminds him of our anger at the pervasiveness of AIDS and our shock when it touches people we love. However, he has a tendency to painstakingly spell out the meaning of such images, rather than letting them speak for themselves. The book is further weakened by Valdiserri's impulse to sentimentalize, especially about pets, plants, and childhood; a plate from his parents' house reminds him ``of a time in [his]...life when questions always had answers, when troubles were transitory, quickly dispatched....'' Gardening in Clay has moments of insight, but its sentimentality and lack of subtlety hinder it from a more profound engagement with its subject.